The Glendwagen as it is called everywhere is a true military vehicle as the tradition says. Unfortunately, it attracts as much attention as a modified Tata Sumo would attract. Out on the road, people were oblivious to its presence and all my hopes of getting attention like what people usually get in a Mercedes, were quashed. Do you really want me to go into the looks section? Okay, wish granted. The ground clearance of this SUV is more than the Tata Sumo and with the front bull bar, supported by two plastic claddings. Apart from that the center of attraction is the 3 pointed star in the middle of the chrome grille and those circular head lamps flanking it. The air dam looks similar to an AC vent from the Sumo. The miniscule fog lamps are placed in the lower bumper. The side profile brings back memories of the Mahindra Bolero. Ohh, the turn indicators are placed atop the bonnet. Truly retro, eh! The 275/55 R19 tyres were truly humongous and befitting the SUV. Somehow, my personal opinion, the build quality felt only a tad better than the Mahindra Bolero’s. Mind you, I am yet to step into the interiors. Those protruding hinges and all make it look very odd, especially with a Mercedes badge. One more thing of notice was the tail pipes peeping at everyone from the side of the SUV. There are four in all. Two on each side.The rear is nothing much to speak about with a small glass area and inverted wiper, with those ugly hinges again supporting the door frame. Tail lamps are mounted on the lower bumper with the single reversing light even lower. The spare tyre sits on the rear door. The interiors are what would separate the Merc from the Sumos and Boleros that I have made reference to in this article. The dirty muddy brown color used for almost all of the Mercedes car interiors is the prevailing theme here as well. The steering wheel is a new unit unlike the other Mercedes ones that I am used to. It gets fat buttons for the audio, cruise and Bluetooth controls. It is a 4 spoke unit partly covered by leather and partly by wood. The seats are 6 way adjustable and have typical comfort that Mercedes cars exude. The meter dials are also typical Merc units but with an unknown finesse. I would rather backtrack on my statements about the build quality as the interiors are fantastically put together. Comfort has been elevated in the front seats but the back seats do really take a back seat as far as comfort goes. Being a 6 footer, I found it hard enough not to brush my knees against the front seats. Head room is adequate but shoulder room is also a bit tight. The boot space is a useful 480 liters which increases to 2262 litres of space once the rear seats are flopped down. Interesting enough. 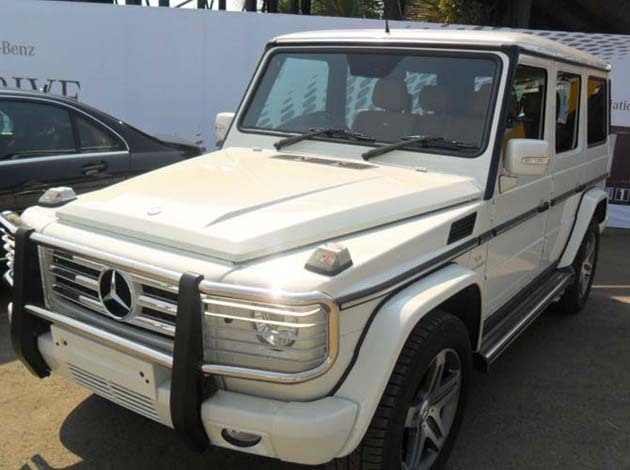 The Mercedes G55 AMG in India is not a soft roader but a true brute of an SUV. I only had 5 minutes to check its off-roadability and the car was more poised in the mud rather than on the road. It has got, a world’s first, three lockable differentials. This combined with the sheer muscle of the engine were enough to power me out of one particularly sticky patch. The only problem is that quad exhausts on the sides. They are a bit lower than my liking and I am sure where a Land Rover would just move out of the mud patch, with the Mercedes G55 AMG in India, it would be a problem as those silencers may get grounded. Speaking of the exhaust systems, they have been tuned by AMG to deliver the sporty growl that a sports car would produce. At part throttle speeds, the car displays its V8 muscle. Screech it to the redline and it would have that extra sports car thrill that you always desired, but from an SUV, no way. Its behavior on the road is a slightly nervous affair. Its tyres provide immense grip but then they wouldn’t satisfy the cornering enthusiasts. It has got body roll but in limited proportions and certainly not expected from such a tall SUV. The suspension is on the stiffer side and this means lower speed bumps get amplified but not overtly uncomfortable. Speed up things and everything feels well planted. The steering wheel has more locks that even Godrej can think of and it is devoid of feel as well. The engine in the Mercedes G 55 AMG in India is a 5.5 liter V8 unit which pumps out 507 Bhp of peak power at 6100 rpm whereas the peak torque of 700 Nm comes in between 2750 – 4000 rpm. No, its not a diesel engine but a petrol unit tuned by AMG. It is mated with a 5 speed auto transmission. The transmission is silky smooth and is one of the best transmissions in the Mercedes stable other than the 7 speed ZF one. Since it was a 30 minutes test drive, I could actually time the performance figures. The 0-100 kmph run was achieved in a scarcely believable 6.1 seconds. The run actually made people passing close by watch in awe as if a supercar just passed by them. I am sure more than the exhaust note would have made them think of the same. I couldn’t check out the top speed however. But a certain Mercedes engineer present told me that it has an electronically limited top speed of 215 kmph. Come to think of it, it has got a 2.5 tonne kerb weight. Brakes were also highly effective and they were aided by the usual four channel ABS, EBD, traction control and ESP. For the safety thing, there are 4 air bags, side impact beams, seat belt pretensioners, panic alarm, security system and also tracker system. There is also a reverse camera provided. Very useful in this car, I would say. It been an AMG and all, expect the mileage figures to be in single digits for both the city and highway runs. Test drive done and now time for some analysis. If you are looking at sheer performance plus off roading capability, then look no further than the Mercedes G55 AMG in India. It gives a rush that no 2.5 tonnes vehicle can give you. Moreover, its off roading capability is legendary. 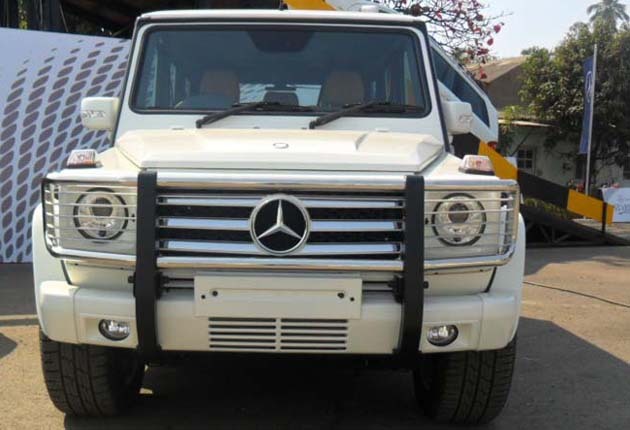 So if you own a farm house somewhere near Chikmagalur and want to reach there faster and in proper shape, then the Mercedes G55 would be the best bet. That is only if you can look past its looks, which wouldn’t give you the second glances that every Mercedes warrants. 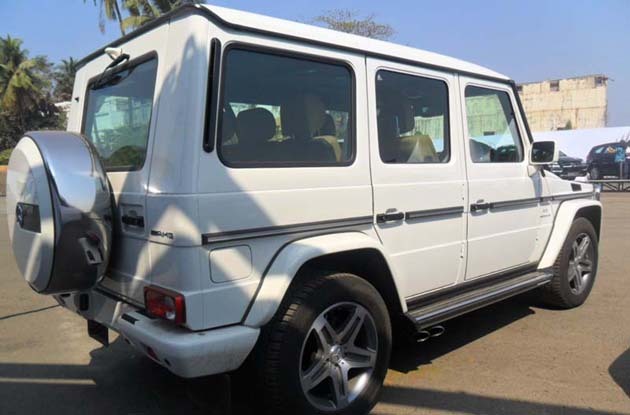 One more thing that you cannot ignore is that the Mercedes G55 AMG price in India starts at Rs 1.1 crores ex-show room. I had actually heard one of my fellow scribes repeatedly asking me if the price was right and my answer was a patient yes. Now, if you have enough moolah, then go and buy yourself one fast as Mercedes are going to sell this SUV in limited numbers here.